YamYam is yummy! The new star in the fast-food firmament. "Because everyone wants to go!" runs the colourful headline January 2040. You are not yet in YamYam? This state of affairs cannot continue! Because as of now YOU are taking care of people’s hot and cold snack needs. 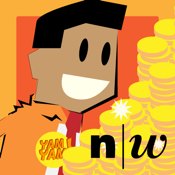 Step straight into a business of the future - become a successful manager of your own YamYam shops. And that's just the beginning of your rapid career progress. Delicious YamYam packs are already in your Storehouse. The people are waiting for them! Make the best deal! Are you ready to go? Have you set the optimum price? The future is uncertain! Each day is different. Every day a new price. This is your chance. This is what you've been waiting for! Time to bring your YamYams to your customers at the best price!